Stare! by Game Development Group, Inc.
Furrowed brows and hearty laughter are the most likely outcome of this fun but challenging new game from Game Development Group. The object is to be the first to reach the end of the game board. Been there, done that, you're thinking? Look again. 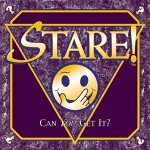 In fact, stare hard--because that's the only way you'll get anywhere. Players (individually or in teams) must stare at an image on a card for 20 seconds. Actually, that's the challenging version. Depending on the relative level of masochism at the table, you can opt for the almost impossible version--stare for 10 seconds--or the general version, stare for 30 seconds (best if there are kids playing), and then answer questions about what you saw. It's not easy folks--just try to remember what color socks the man next to you on the bus was wearing this morning, or how many people were reading magazines.